When I was very little, I would ride with my parents from Long Island to NYC; my parents would go to work, and I would stay at my grandma’s house until they returned. We’d usually stop at a coffee truck pulled over on the side of the road and grab breakfast: for me, a carton of chocolate milk and a slab of crumb cake. 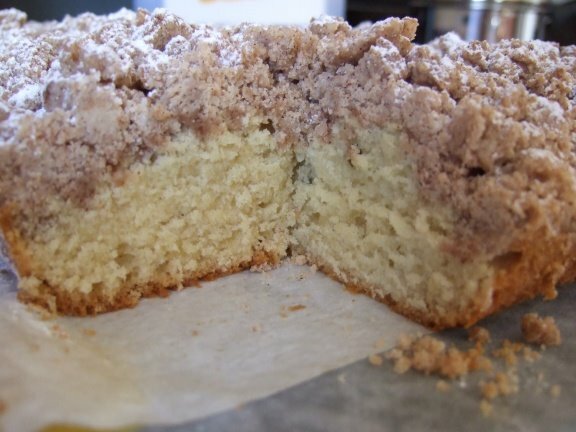 I would ignore the cake’s base (more of a sweet bread than a cake anyway) in favor of the sugary crumbs. It’s something I hadn’t thought about in years until watching Cooks Illustrated’s podcast on New York Style crumb cake — and then I had to make it. The result is a moist, dense (but not heavy) cake base topped by heaps — and I mean heaps — of brown sugar crumbs. This recipe does not skimp on the crumb topping; even after you slice the cake into pieces and chunks of topping fall onto the platter, your piece of cake still has a generous crumb cover. The one thing I would change is the amount of cinnamon used in the crumb. Although the cinnamon flavor intensified the next day (and the day after that) I still would have liked a greater cinnamon punch. Next time, I’d probably add a tablespoon to the crumbs, taste them, and adjust accordingly. 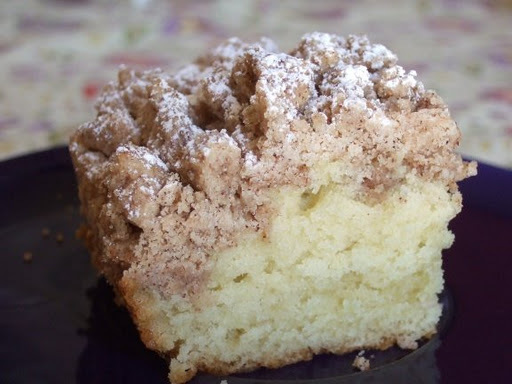 Overall, however, a nice tribute to the NY Style Crumb Cake. For the crumb topping, mix together sugars, cinnamon, salt, and butter in medium bowl to combine. Add flour and stir with rubber spatula or wooden spoon until mixture resembles thick, cohesive dough; set aside to cool to room temperature, 10 to 15 minutes. For the cake, adjust oven rack to upper-middle position and preheat to 325-degrees F. Line a 13×9 pan with a parchment paper sling (spray the pan with cooking spray, lay in a sheet of parchment, pushing it into corners and up sides, allowing excess to overhang edges of dish. Transfer batter to baking pan; using rubber spatula, spread batter into even layer. Form crumb topping into large pea-sized pieces and spread in even layer over batter, beginning with outer edges and then working toward center. Bake until crumbs are golden and wooden skewer inserted into center of cake comes out clean, about 45 minutes. Cool on wire rack at least 30 minutes. Remove cake from pan by lifting parchment overhang. Dust with confectioners’ sugar just before serving. Love love love this recipe! Made it for the second time and I agree more cinnamon!